Gelerts are known for their loyalty and trustworthiness. They are generally kind, like good old Gilbert, the yellow Gelert from Pick Your Own, or Bruno, the cursed hero involved in the Tale Of Woe. Though there are a couple notable exceptions, though Gelerts are loyal sometimes they are loyal to the wrong side. Most well-known for this is Kanrik, the leader of the Thieves Guild who worked against Hannah in the Ice Caves. Though there are always some bruised berries in the bunch, Gelerts overall are a fun-loving, affable gang and are not strangers to fun. They love digging around in the dirt, exploring new areas, and playing with all their Neopet buddies. They take well to a large variety of Petpets, almost becoming a protector of some sort to them. What you will also notice about these long eared canines is that they love to dress up. They are one of the most customisable species out there, and whether you want to look like the doctor at the Neopian Hospital for a costume party of go with a more quaint, subdued look, there is an outfit for your Gelert. But something that stands out for this species, one thing that is consistent in almost every single Gelert: they love a good wig. Gorgeous curls, flowing waves, or even a dark blue mullet, there is a Gelert specific wig for every type of hair. And why shouldn't there be?! There is nothing quite as nice as looking FABULOUS! Let's dive in to some of the options you have to style your canine with, shall we? You can find these wigs in shops across Neopia. Bald is beautiful but sometimes it's nice to dabble in the dark arts known as wigs once in a while, and how much darker can you get than this Emo Gelert Wig. A navy blue beanie paired with jet black, swooped hair underneath. The straight bangs that fall in front of your eyes convey a message to the world, and that message is "don't talk to me". The item description even comes with the promise that there will be no mistaking your emo identity. So if you forgot to visit the training academy for your free training, this is the wig to rock. Safety first! If you are planning to spend your weekend darting around the go-kart track, make sure you grab this wig and helmet set. It even comes with a pair of goggles to keep Petpetpets from splatting in your eyes as you speed around the track. The beautiful blonde curls fall down past the shoulders and blow in the wind so flawlessly you'd never guess the hair is synthetic. The only downside to this is that the designer never actually put hair on the top of the head, so you cannot remove the helmet unless you want a bunch of exposed lace front and a monk-like hairdo. Casual. Cool. Hip. You don't need to add a bunch of flair and pizazz for everyone to know you're a cool guy. When you just want to be casual without being so casual you don't have a wig on. The craftsmanship of this hairpiece is top notch and really sets it apart from the cheap wigs you'd find all knotted up in an Granny Hopbobbin's attic. When you just want to kick your style up a notch, be a bit beyond casual, you'll go for this super fashionable wig. It's actually extremely similar to the Casual Gelert Wig but that hair has been teased out a bit more and a shiny yellow hat has been added on top to act as a statement piece. This is what you wear out when you want to be noticed, when you want others to stop and stare with envy. There is no shame in taking those few extra steps in the morning to feel cute and this wig will make you feel CUTE. These wigs you can only get by painting your Gelert with a rare Paint Brush. From the Halloween Paint Brush, this wig featured black and grey hair gelled to the max. Spikes sticking up all over, almost forming a mohawk, this is perfect for a rock and roll look. 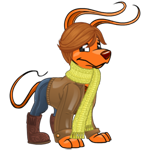 Originally this hair was made to give your Gelert a vampirish appearance but with the right customisation, you can look like a cool skater or edgy French romantic. This wig is so versatile that it really is up to you how the whole look comes together. Don't be afraid to experiment! With this dark blue hair from the Lost Desert Paint Brush we can really see how dark and navy blue is an extremely complimentary color for Gelerts. This hair is not quite as versatile as the Halloween wig, but with the right Lost Desert or even Shenkuu customisation, this wig does work in a variety of looks. The simple straight mid-length hair really lends itself to the long neck and sturdy shoulders of a Gelert. What a dream! The Mystery Island Paint Brush will give you this adorable leaf green short-haired wig that sits so perfectly atop your Neopet's head! This look is perfect for any floral, summery customisation you can dream up. It is bright, prominently features a flower straight from Mystery Island, and is short so your Gelert's ears won't overheat in the hot sun. This is one of my favorites. These two gender-specific Gelert wigs come from the expensive Royal Paint Brush. The navy blue color pops up again, this time as a mullet with a very tall crown that screams "I'm rich!!" On the flip side, the female version comes with this beautiful deep purple hair and a cotton-candy swirled hat. The Royal Girl Gelert Hat could easily fit into a candy customisation, or a sweet utopia themed pet. The possibilities are endless when you have this many wigs in your closet.